On DeLeon's journey through present day Atascosa County, he described a region of good land and thickets. He reported crossing a dry creek and then a running creek with many oaks and grapevines. This was the place where he camped and called the stream Arroyo del Vino. Long before the European explorers, missionaries, soldiers and traders came, the trails already had been carved by the buffalo, Native Americans and perhaps Aztec traders. Atascosa comes from the Spanish reflexive verb atascarse meaning to mire oneself or to bog. General Alexander Somervell, on his march in 1842 from San Antonio to El Presidio Rio Grande described the place as one where horses and mules sank to their bodies in sand. The area became known as the bogs or The Devil Eight Leagues. Atascosa was the name given to the main stream traversing the area. It seems only fitting that in 1856 when a county was formed it too was named Atascosa. 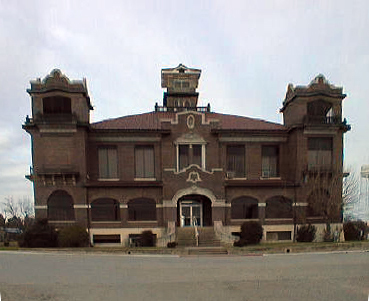 The county seat moved from Pleasanton to Jourdanton in 1910. The Court House was built in 1912 and is the only one in Texas built in the Mission Revival Style of architecture. Atascosa Chapter DAR was organized on 3 June, 1981. Chapter meetings are held on the first Tuesday of each month October through May. Members contribute to our local EMS, Fire Department; Battered Women's' Shelter, Atascosa County Genealogical Society and our High School's various programs. The Chapter contributed to the refurbishing of Constitution Hall by purchasing a chair. We participate in the American History Essay Contest, Good Citizen Contest, ROTC Awards, and send soup labels and clothing to the DAR Schools. 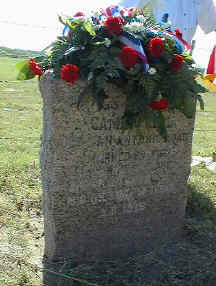 Under the leadership of Honorary State Regent, Virginia Stegall, the Texas Daughters began efforts to locate and rededicate the granite markers placed along the El Camino Real, or Old San Antonio Road, by the Texas Society DAR in 1918. Eight markers were located along the Old San Antonio Road in Atascosa County. Our chapter members, with the help of our friend and local historian, Robert Harris, have found and rededicated seven of these markers. Some of the markers are now on private property, but all are in good condition and we were able to photograph and record GPS co-ordinates for each of them. We continue our search for the eighth marker, while caring for our adopted seven.